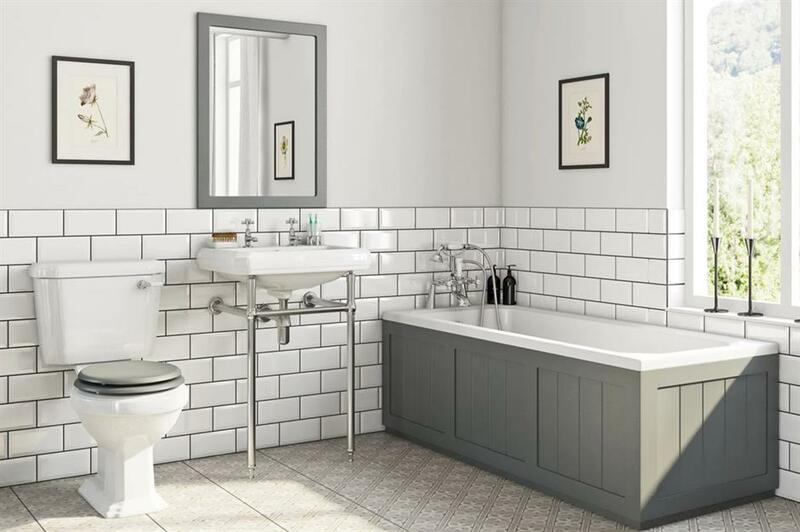 With the latest sanitary ware, storage pieces, tiles and flooring even the dinkiest bathroom can be made to function brilliantly and look absolutely fabulous. 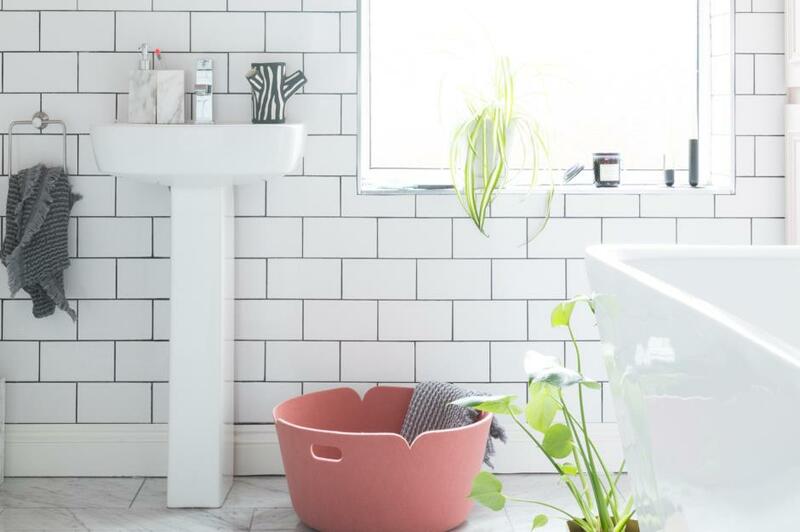 Get ready to steal ideas for your tiny washing space from these highly practical yet still super stylish small bathroom schemes. 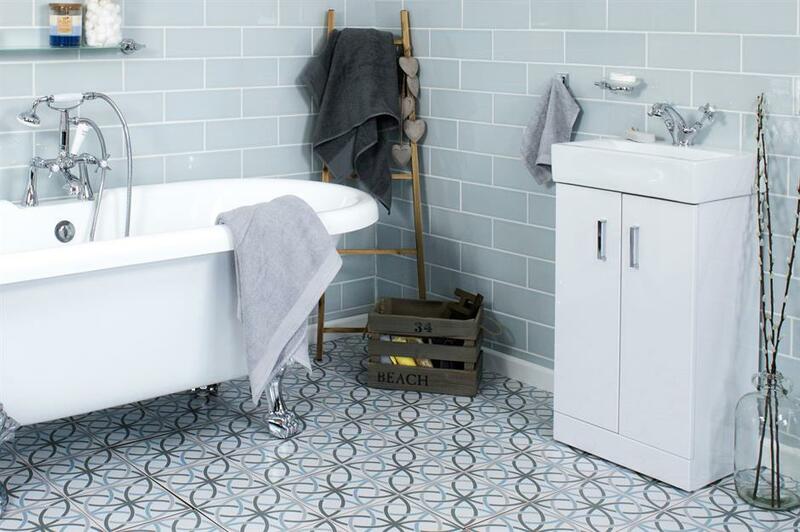 Laying a patterned floor in your small bathroom is a sure fire way of giving it a big personality as it's an eye-catching trend that suits all styles. The rest of the bathroom needs to remain relatively plain in comparison to balance the space, while wall hung fixtures will let the pattern pop. Want to transform your home's tight spaces? Check out these 51 smart ideas for tiny living. 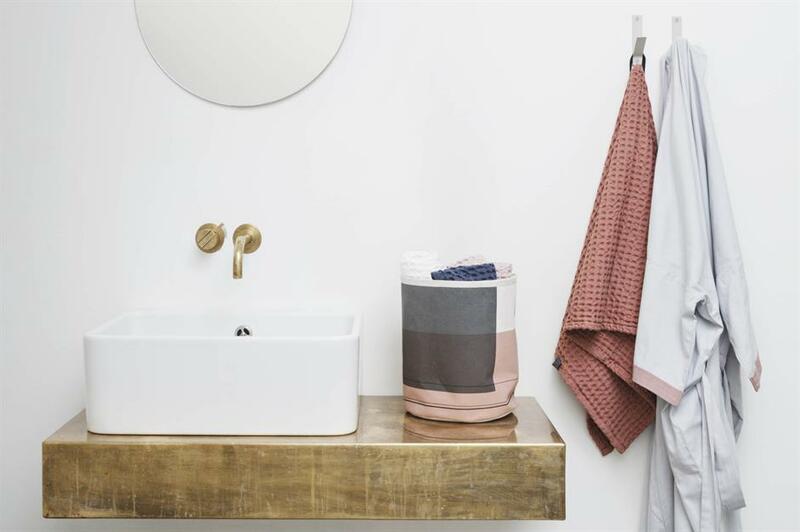 Neutral colours will turn your little bathroom into a small and soothing sanctuary. 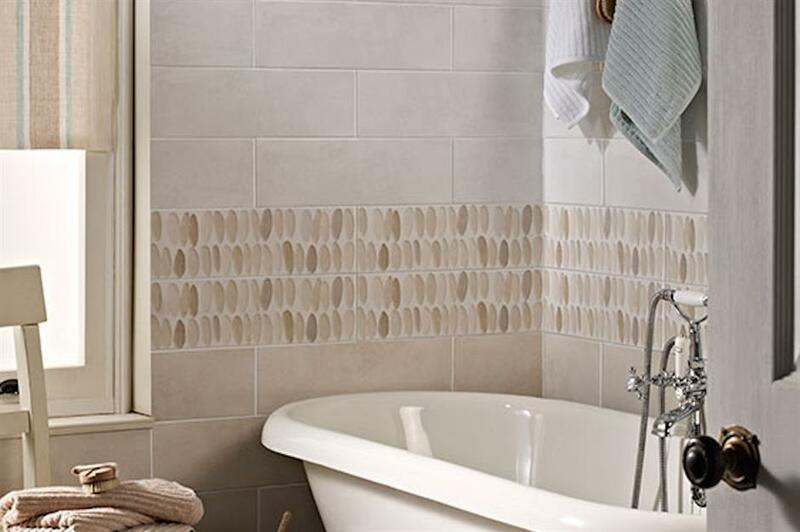 Choose pale toned tiles with subtle texture for interest like these pebble-inspired raised decor tiles. 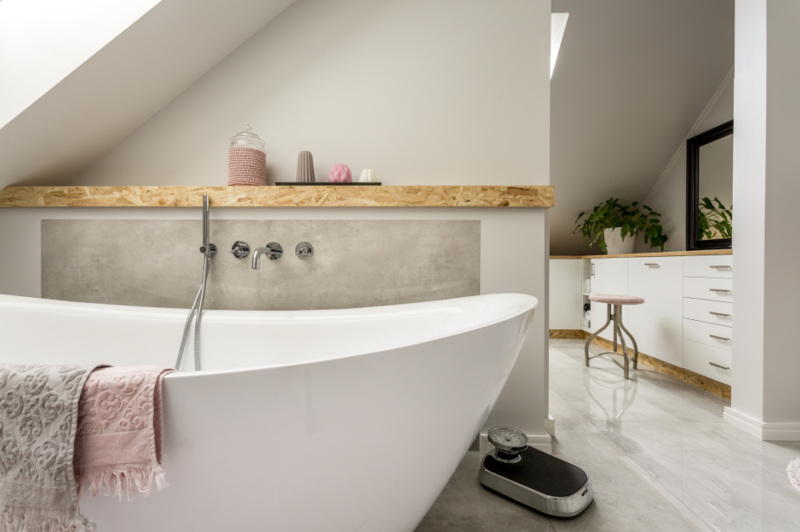 If you can, squeeze in a modern roll top bath to complete the spa-like space. 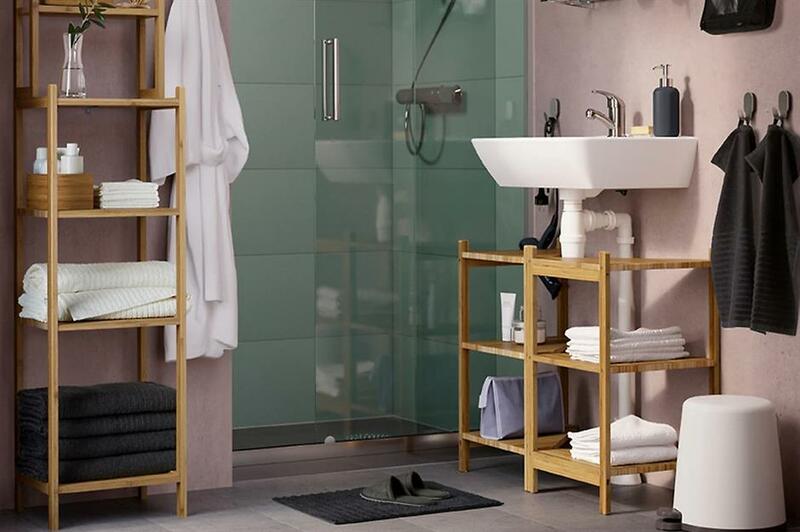 Wooden or metal storage ladders make great additions to smaller bathrooms as they are a visually stylish way of storing and drying towels. And being vertical in design means they take up very little space. Leaned in the corner this one breaks up the full wall metro tiling nicely. Half-way tiling or tiling just wet areas of your small bathroom means you can cut costs if you are on a budget. Keeping the upper walls tile free will also open up the room to make it feel more spacious. Mount artwork on the plain painted walls to tie your bathroom scheme together. This small Crittal-style bath screen is a great way of introducing new trends into small spaces. The strong structural lines are clean and keep the small space effortlessly streamlined. 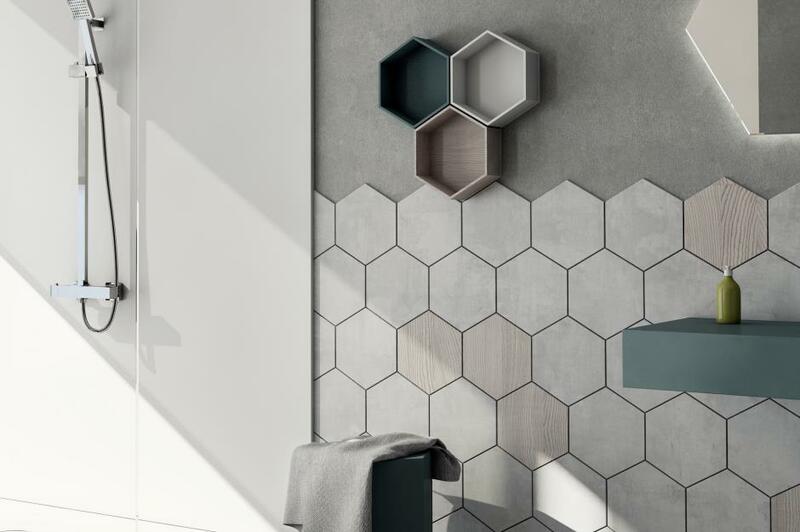 Continue the cutting edge style with matt black fixtures set against white hexagon mosaic tiles. The overall look here is ultra-modern and striking. Tiles can work wonders in the kitchen too – browse these budget-friendly decor ideas. 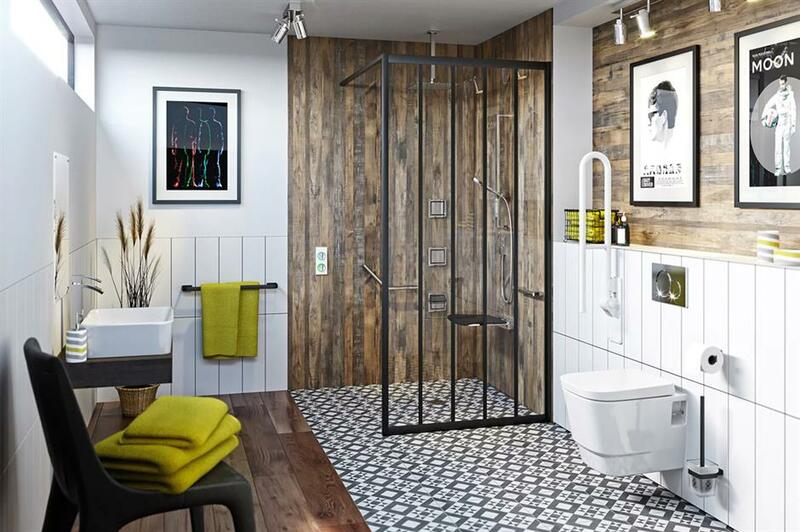 Monochrome colours, warm wood and zingy lime make his small bathroom scheme uplifting and funky. Zoning the wet area with patterned flooring creates a bigger open-plan vibe and looks glorious against the salvaged plank style wall panels. 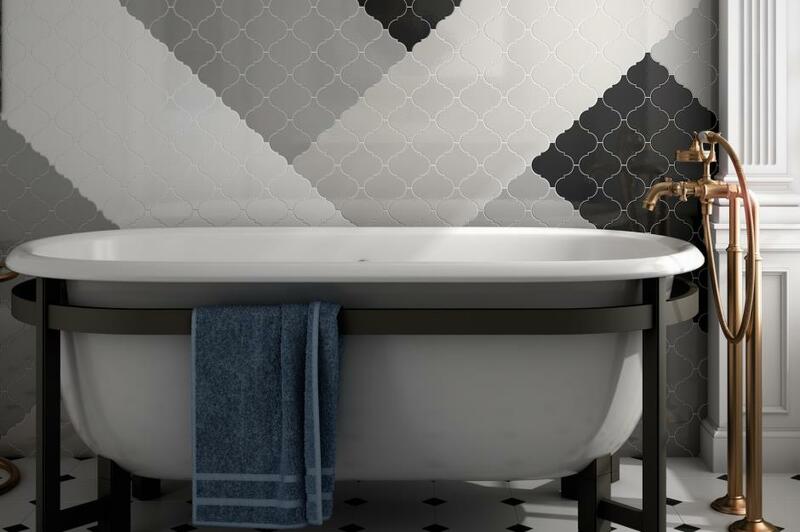 Choosing a shower screen over a shower curtain will keep a small bathroom from looking cluttered allowing you to create a focal point, like feature tiles, elsewhere. This panelled version is even better as it can be folded away when not in use causing no obstruction. So you have a small bathroom but don't want to sacrifice your bath? 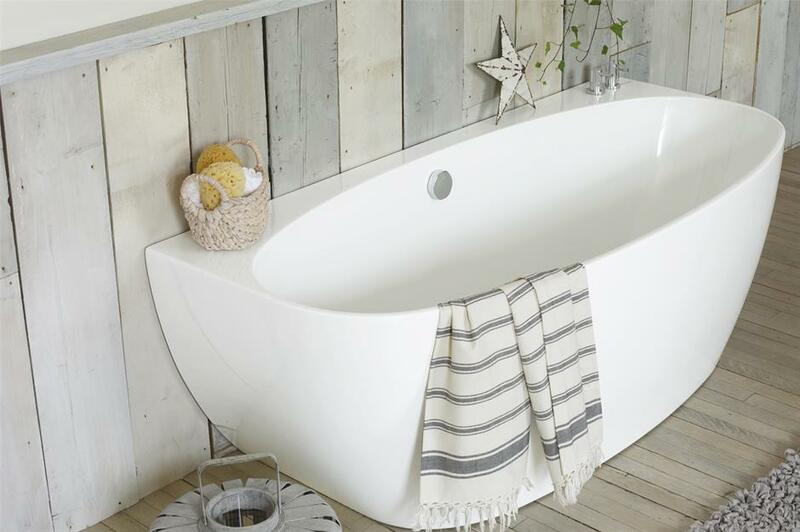 No problem; wall-mounted slimline baths are narrower but not shorter so you can still enjoy your long hot soak whenever you want. Give your small bathroom an elegant style element with timeless and co-ordinated cabinetry. Vanity units with cupboard doors will keep surfaces clear and tidy. Painted wood finishes will add structure and substance and as long as balanced with a pale backdrop deep tones will give the room plenty of character. 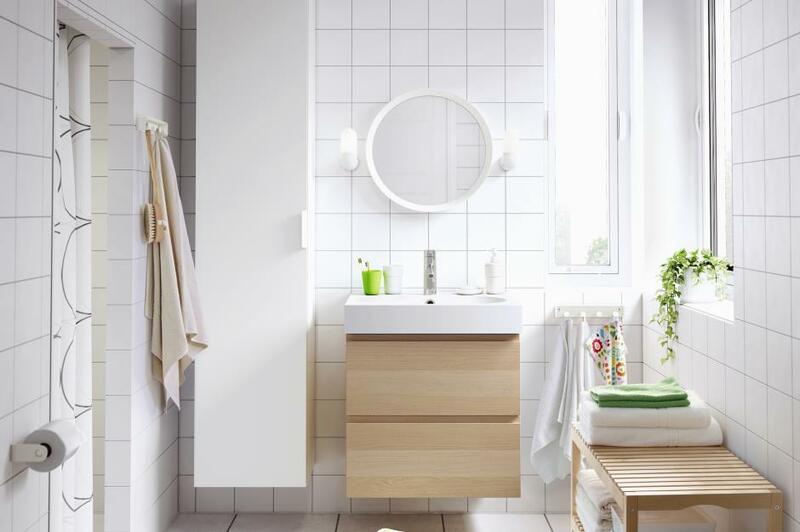 Tiered, moveable storage is a small bathroom's blessing. Perhaps best used to store more attractive toiletries and folded flannels, the free-standing element allows you to transfer it around when necessary. Or even keep it in another bathroom when not in use if space is super tight. Integrating as many fixtures and fittings as possible will open up your small bathroom space making it feel contemporary and well finished. Minimal wall mounted taps like these (especially in an on-trend gold finish) can give even the simplest of bathrooms a 5-star luxury feel, minus the hefty price tag. Stick to a two-toned colour scheme of just black and white. 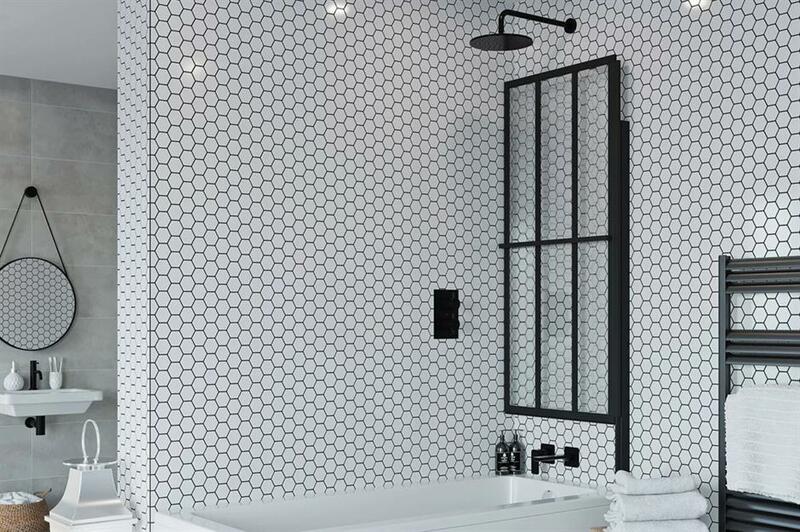 All-white tiles will enlarge the space no end while black additions are striking and sophisticated. Here, strong lines and contrast make this contemporary, small bathroom look smart and masculine rather than clinical and sparse. As long as you don't over-clutter the shelves, open storage will keep a small bathroom looking relaxed and homely. Knowing where toiletries and towels are kept is practical too, especially in family bathrooms when there is a morning queue outside. 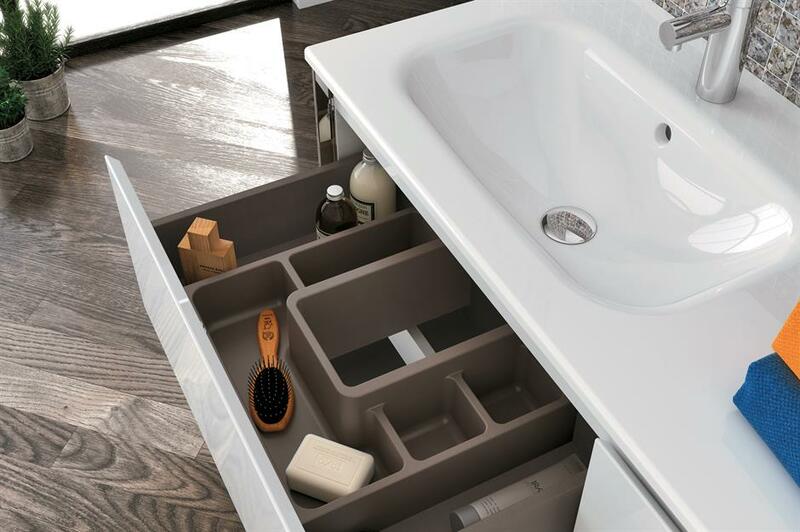 Sliding draws aren't often the first storage option that spring to mind when planning a small bathroom design and we don't know why? 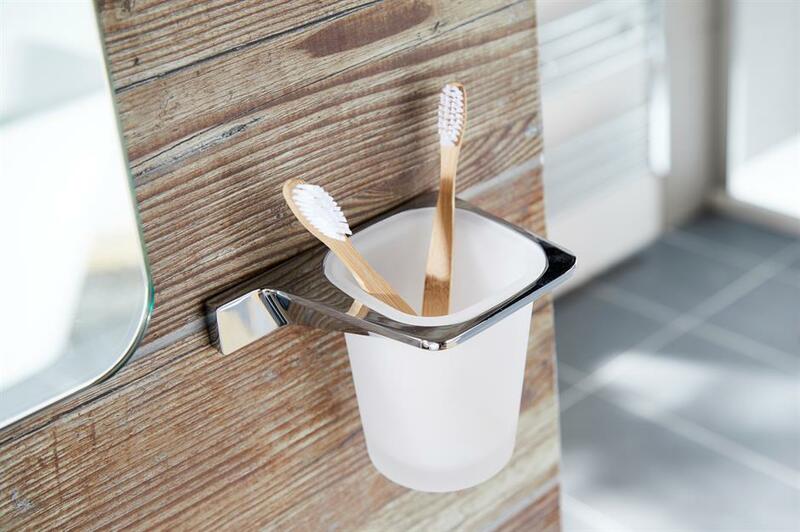 As long as they are kept organised with tidy spacers, they are the perfect pull-out home for hiding smaller toiletries and tools like hair brushes, dental floss and tweezers. 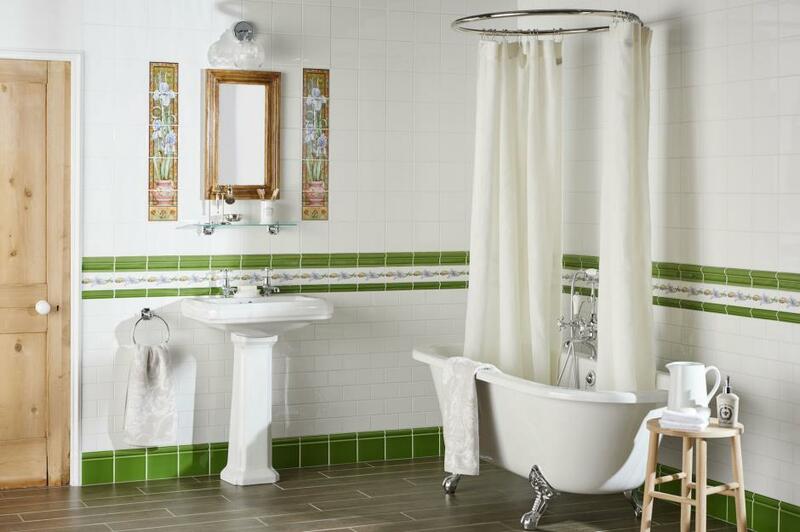 Lack of decoration space can often make small bathrooms dull and like or like a show-room. A high-shelf that sits above eye-level is a practical way to inject decorative personality without compromising on space. Display artwork, structural greenery and special occasion toiletries in groups of three and make sure you remember to give it a regular dusting. As well as wall-mounting fixtures, don't forget you can do the same with bathroom accessories like towel rings, toothbrush holders and soap dispensers. It will not only keep what limited work-top space clear but give your bathroom a professional finish. Invest in stainless steel sets to avoid rusting. 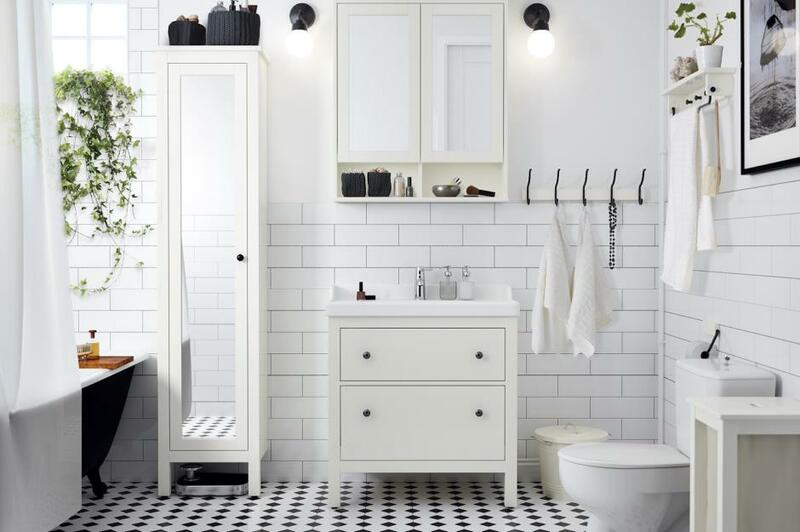 A furniture pack or set that incorporates your bathroom suite is a practical small space saver. The popular choice creates additional work-surfaces and is seeing a revamp with new designs in modern materials and shapes. This raw grain wood finish has a refreshing coastal vibe, particularly when teamed with cool grey walls. 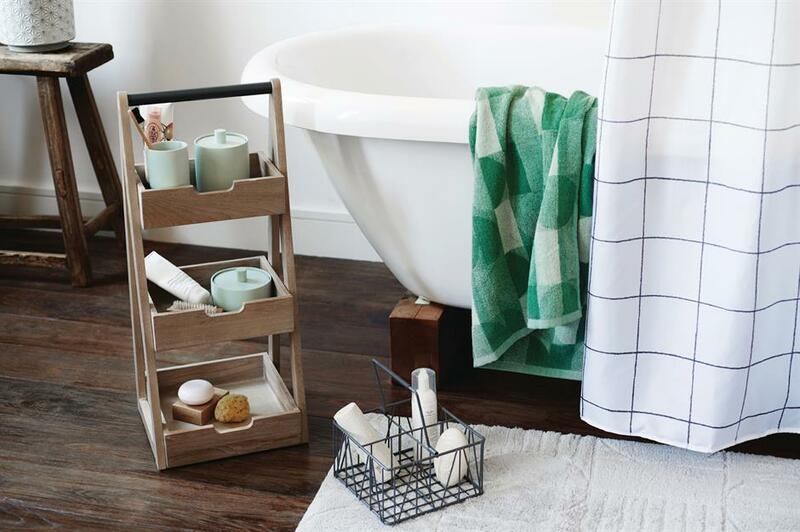 A bath caddy or bath bridge are a cost-effective and quick storage fix especially for small bathrooms in rental properties. 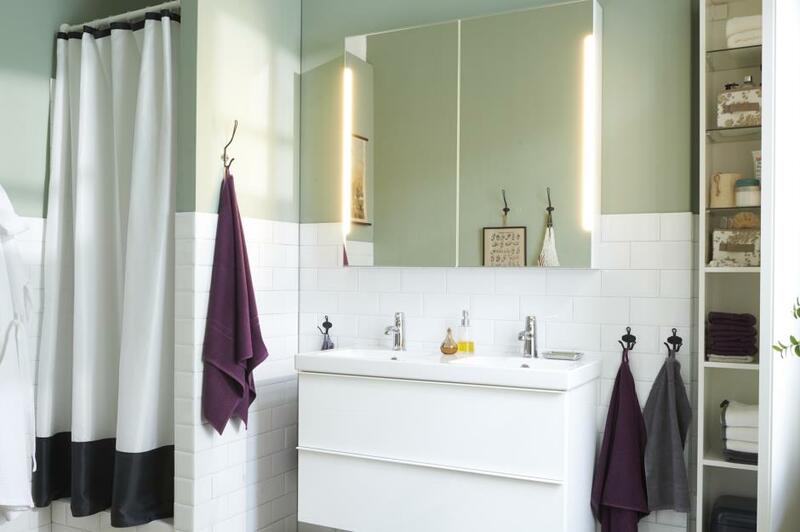 Whether it's wooden or metal effect or chrome, this clever space-saving hack will suit any bathroom style and make bathing a more comfortable experience too. 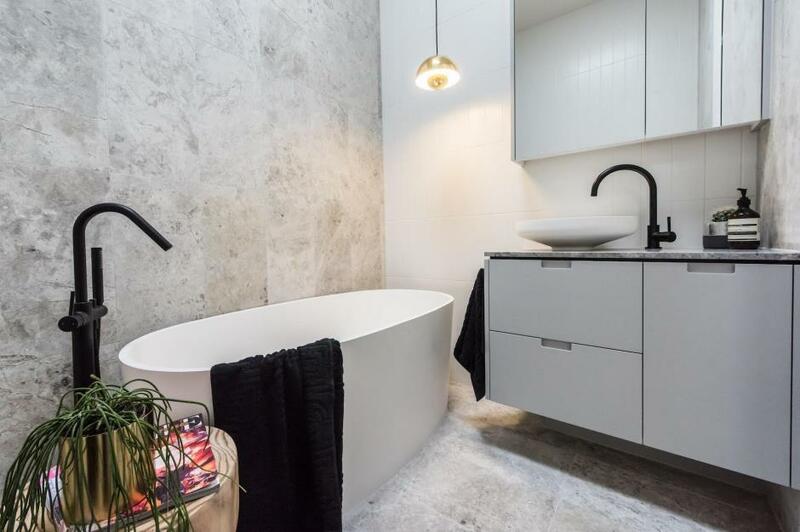 This narrow bathroom is proof that you can create 'wow' factor in even the smallest of spaces with a few clever tricks. 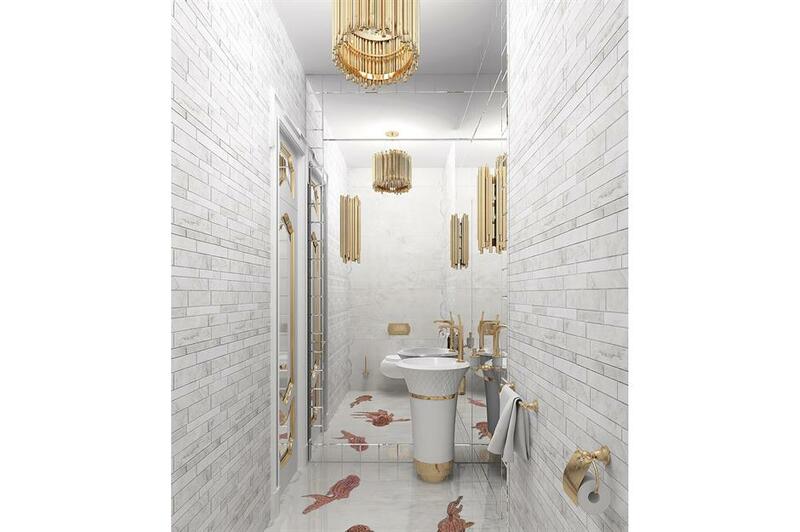 A floor-to-ceiling mirror instantly doubles the length of this glamorous bathroom and swimming fish motif floor tiles deceives the eye into seeing hidden depths below your feet. Metallic gold accessories and pendants bounce light and give off an air of pure opulence and luxury. Modern heating systems mean many homes often have redundant airing cupboards. If it's big enough and you can find a new home for your linen, then this space can be transformed into the perfect cubical shower. Seek advice from a professional who can assess whether your existing plumbing will incorporate the new addition. 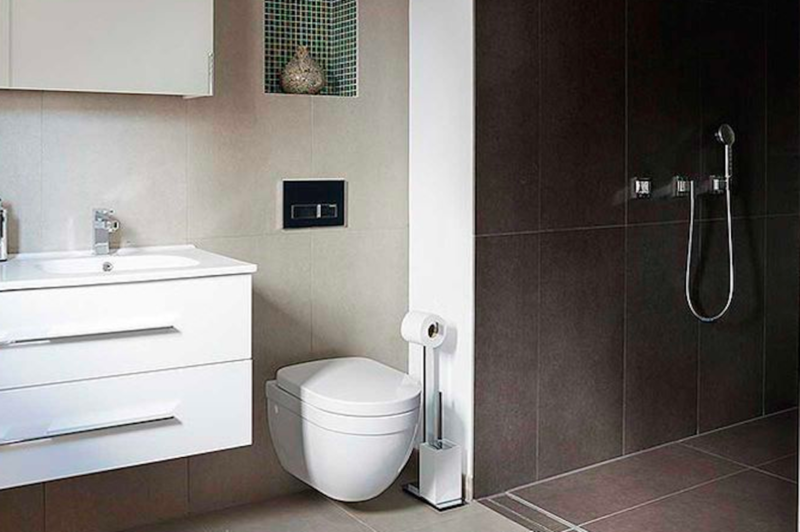 Bare wall space over the toilet is often overlooked but thought about properly can become an attractive storage solution. Shelves, slim cupboards or even DIY mounted baskets can become a decorative statement and keep room sprays, toilet paper and reading material orderly and within easy reach. 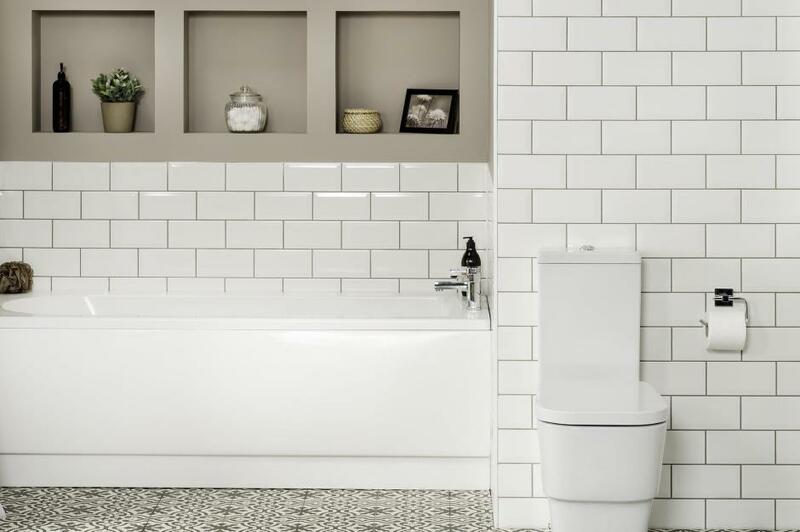 When space is tight every inch of floor space counts so look out for innovative ideas that can make your small bathroom practical and liveable. 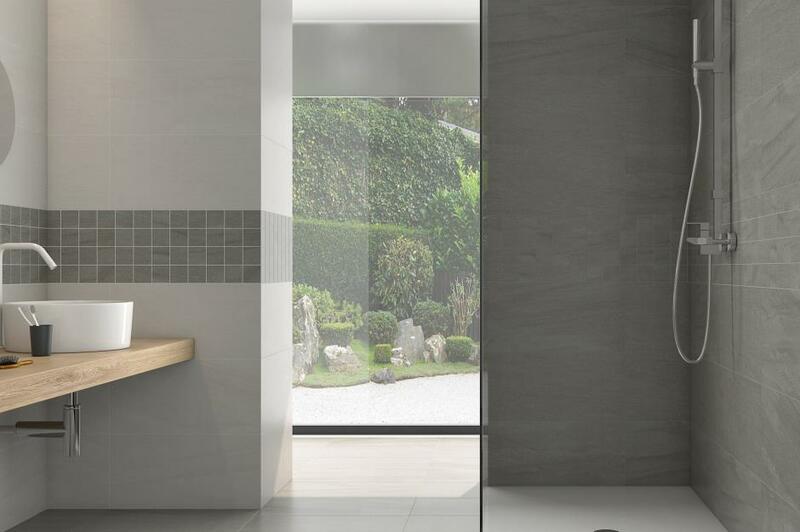 A trayless shower with fold back doors means you can open up space and make use of the shower area when it's not in use. Different floor tiles like an easy-drain, pebble-style will give the shower area subtle definition. 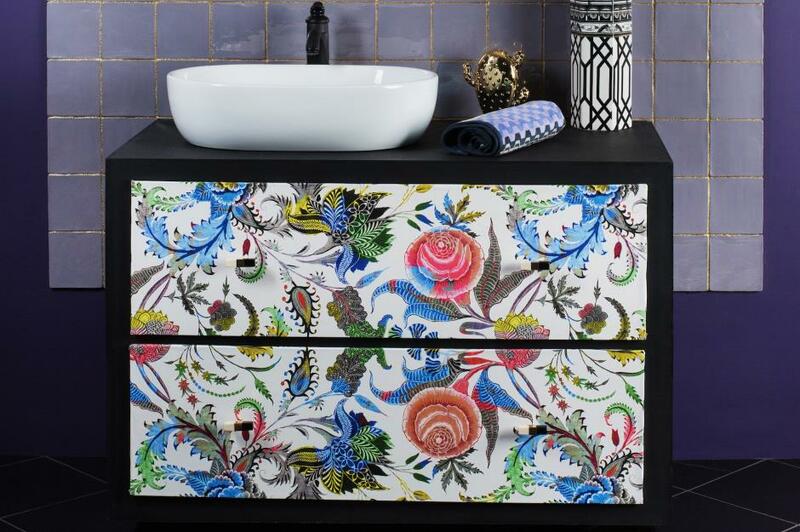 It's often easier to be more daring with colour in a small space, such as a bathroom. If you get it wrong it's not such an expensive mistake to fix, but chances are you will be delighted that you went for the bold option. 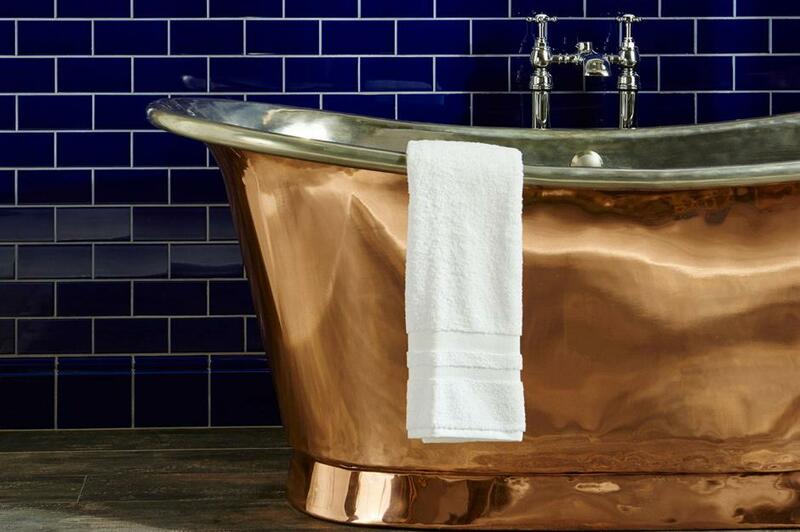 For an on-trend look that won't date, team a period-style bath tub, perhaps in a contemporary copper or silver, with rich indigo tiles and opt for the latest wood-effect floor tiles that look and feel so like wood it's hard to believe that it isn't the real thing. Just because your walls are narrow it doesn't mean that you can't make a feature out of at least one of them. Turn the main wall that you look at into a feature wall, either using a pattern of tiles, stripes of different coloured bathroom paint or perhaps a digitally printed splashback that can be designed to display any image of your choice. When wall space is taken up with towel rails, windows and shower cubicles, sometimes there is no room left for storage furniture. Use large baskets instead and fill them with folded fresh towels and pretty toiletries. Get a box with a lid for those less attractive items such as toilet rolls. Just make sure that they are all made from a material that won't degrade in the damp atmosphere of the bathroom. Light colours will draw your walls outwards and so help to make your compact bathroom feel a little larger than it actually is. You can play around with creams, taupes and pastels and even introduce pattern and still create a lovely light and airy space. Of course, a white bathroom is probably the brightest and lightest option. Medicines, razors, cotton buds; there are certain items that you keep in a bathroom that you really don't need out on display if it can be helped. If your walls allow, you need to bring in as much hidden storage space as possible. A tall unit is useful for storing towels and linen. 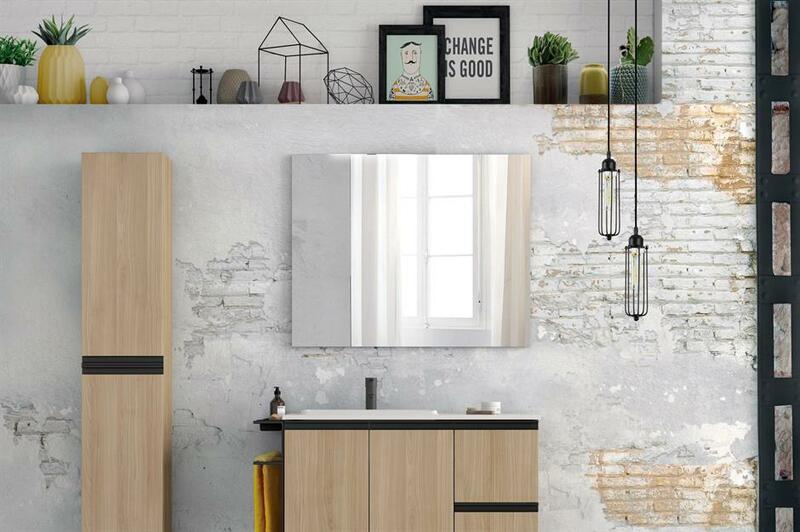 A vanity unit under the sink is great for make-up and toiletries and a medicine cupboard that doubles up as a mirror above the sink is obviously made for first-aid items. 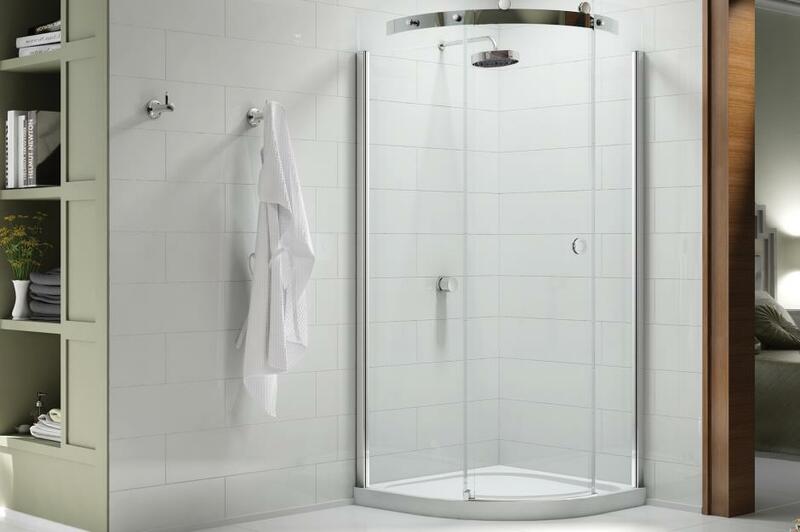 With careful planning it is possible to have a high-end shower cubicle without a bulky door. 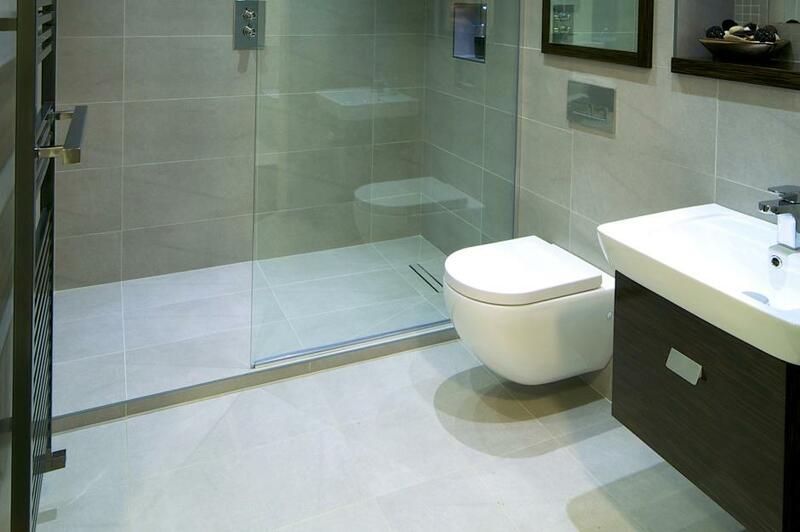 Opt for a deeper shower tray to contain the water and a single side panel of glass to enhance the feeling of space. Shower doors that open into the bathroom will limit usable floor space so choose one that opens inwards or slides across. 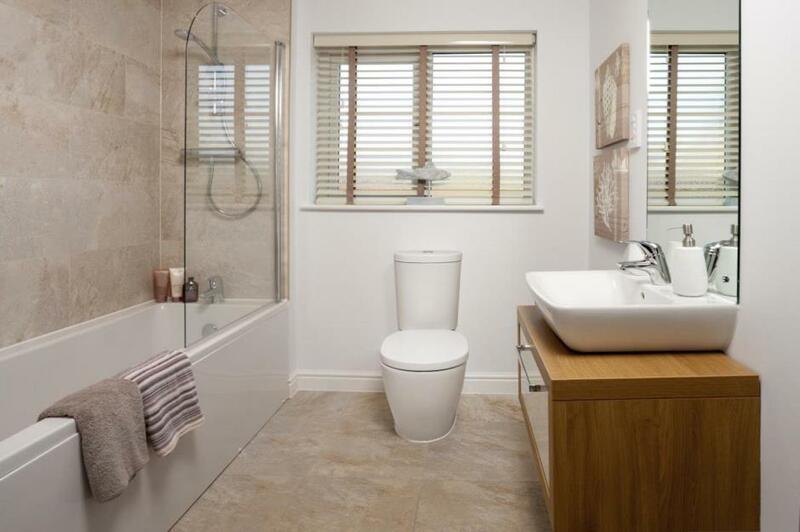 Use clever optical illusions in your small bathroom to make it feel much larger and more spacious than it actually is. Tiles can play a big part in this. Tiles placed in vertical stripes will help the walls to feel wider, those that run in vertical stripes will help to make the room feel taller, while tiles that sweep outwards in a V-shape will help the whole room to feel bigger. 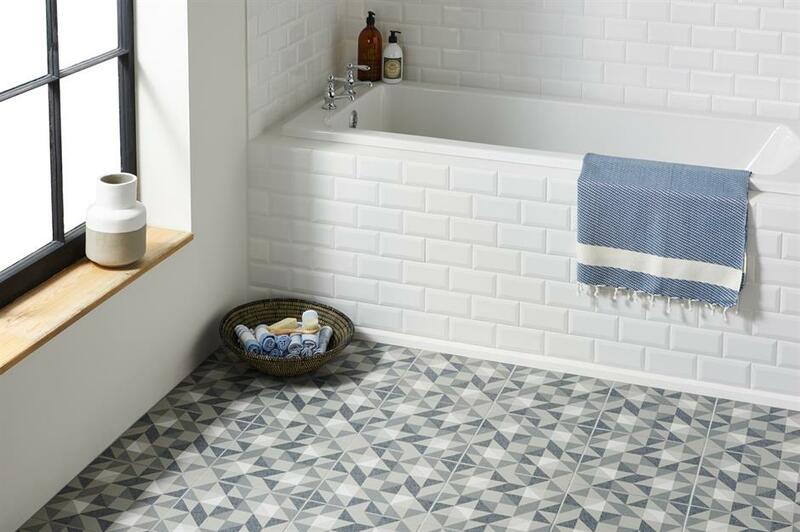 Make your bathroom feel larger by maximising the visible floor space. 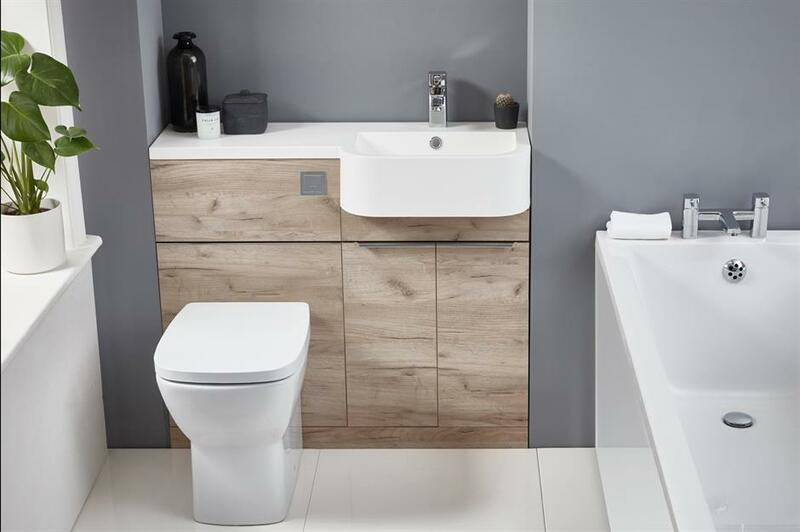 The more floor you can see in your bathroom, the larger it will feel so opt for wall-hung basins, storage units and toilets. These items will also make the whole area much easier to clean too, minimising the awkward spaces that you have to squeeze the mop into. A bath that is raised off the floor showing more of the floor space below will also help your small bathroom to feel larger. It's also worth installing the taps in the middle of the bath so that you can lie in it either way is useful too, so you can position your soaps and bath essentials in the most convenient spot. Or take the taps away from the bath top completely and let the water flow in from a separate stack of taps. To tie the whole scheme together opt for matching taps on bath and basin. 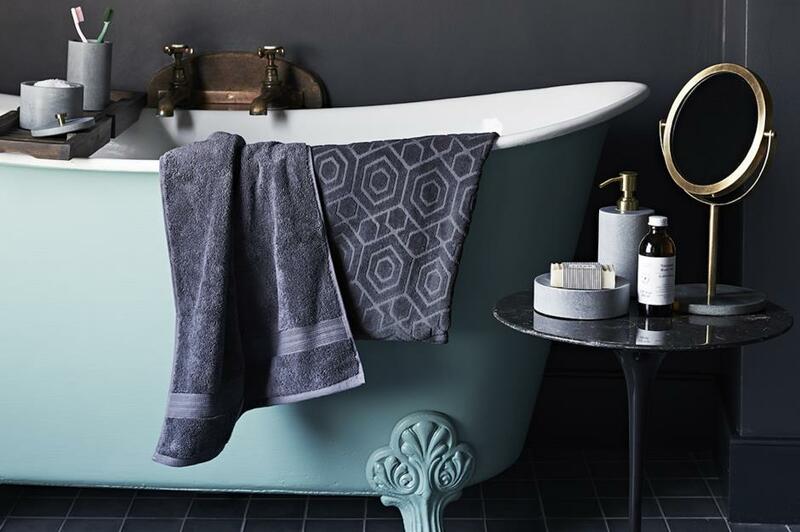 A table also adds an air of informality to the bathroom and is handy for holding useful bathing accessories that might be required from the bath. 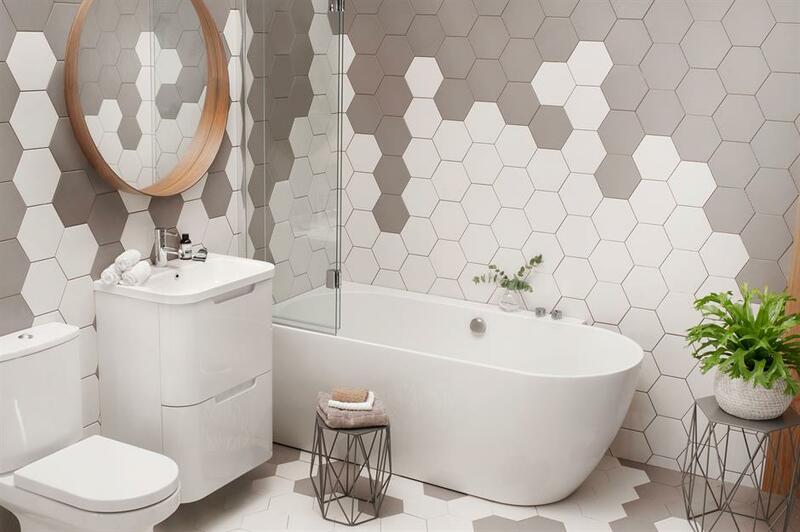 As every little bit of space counts in a small zone, it's important to avoid common design mistakes that can leave a bathroom feeling cramped. To save a few centimetres of floor space opt for a rounded-off shower with a quarter-circle shower tray and doors to match. Go for clear, rather than frosted shower doors, too, as seeing right into the shower is another way of helping the room to appear larger. If you have a small area in your bathroom that will just about fit a shower tray, but allows no room for a glazed shower door, then opt for a shower curtain instead. They will fit any space, are super affordable and they can be easily replaced to when you want to refresh the room. Add a curtain hook and quality fittings to keep the look sophisticated and to hold the fabric neatly to one side. Add an overhead shower above a roll-top bath with a round curtain track fixed to the ceiling. Opt for a traditional shower head and a soft curtain in a plain white or dusky pastel shade for an elegant look. While adding a wet room to your home is a more expensive project than a standard shower area, because it involves tanking the whole room or a large section of it, it can be worth it in terms of space saved and it may also add value to your property. It also totally removes the need for shower doors and furniture that can make a small bathroom feel cluttered. 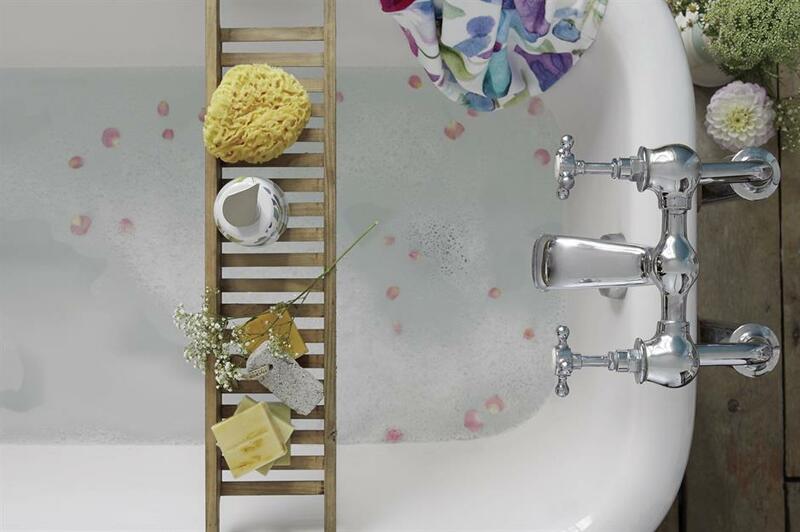 With clever attention to detail it is possible to ensure that you leave no dead space in your bathroom. You may have to duck to get into and out of the bath by placing it under the eaves, but it will not impact on your actual bathing experience. Built-in units can also be constructed in these awkward spaces. They will cost a bit more than a freestanding storage unit, but if they help you to make the most of your space the extra investment is worth it. Mirrors are key to making a small bathroom look and feel larger. Consider ordering a made-to-measure mirror to cover one entire wall and opt for reflective surfaces on bath tubs and basins too. Mirrored tiles bounce light around the room and making it feel bigger and brighter than it is. No space for a bath? Move it out of the bathroom altogether and place it boutique hotel-style in a bedroom or dressing room. Just remember that you will need to bring the pipes up through the floor and you may need to check that your floor can take the weight if you are using cast iron sanitary ware. No room for a separate stand-alone shower and bath? No problem, go for a combination bath and shower. Choose one that has the shower area staggered out to create more space for standing. 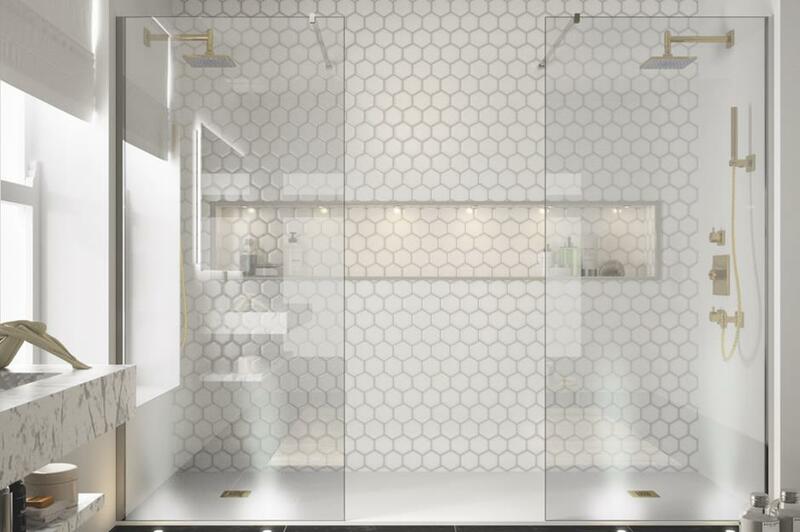 Go for a clear frameless shower screen to so that you can see right into the corner, another little optical illusion that will help your bathroom to appear larger than it is. Make the shower the star of your small bathroom with double-ended shower heads allowing two to bathe at the same time. 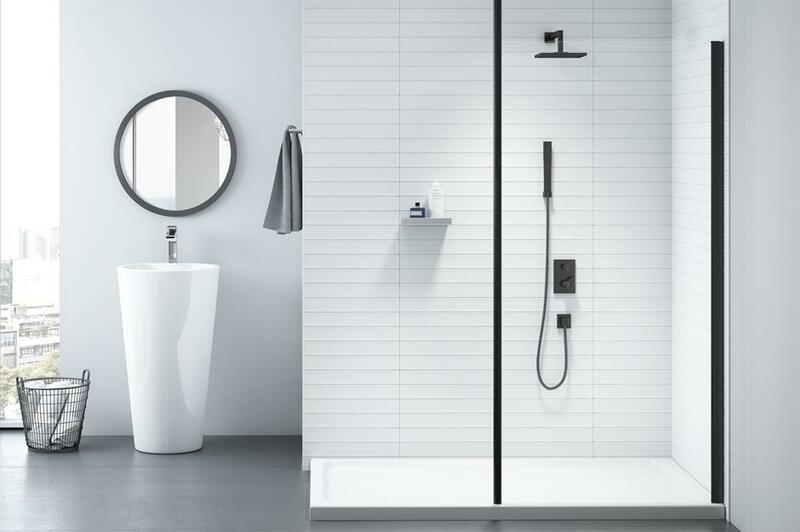 Spoil yourself further by adding smart home tech such as waterproof speakers that bring in music, a steam function and shower heads with a variety of modes such as rain fall and massage capabilities. Avoid furniture with handles and knobs that protrude into the room. Choose drawers and doors that spring open when pushed or go for units that come with a ridge that you can grip to open. This may seem like a very minor detail but every additional millimetre counts in a very tight space. 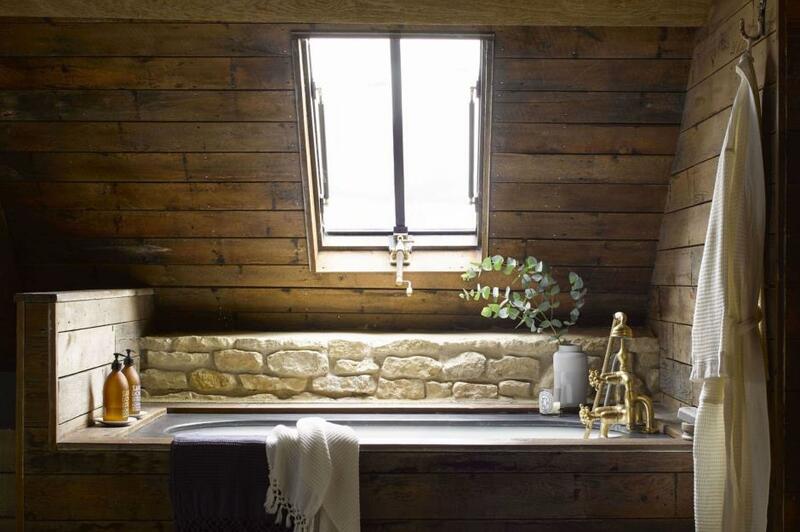 In a small bathroom you can embrace its cosiness and take steps to make it feel even more intimate. One way to do this is to paint it in an on-trend inky charcoal grey or midnight blue. 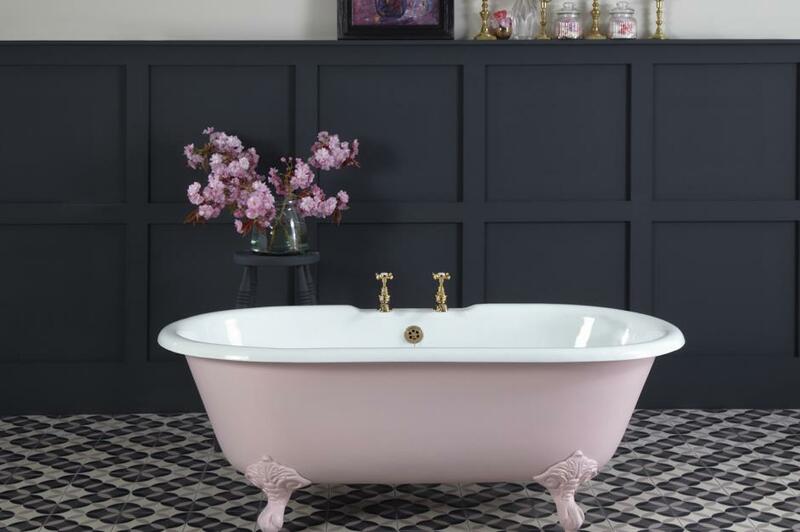 Team this with a pastel painted period-style bath tub, copper tap fittings and fluffy towels to create a spa-like bathroom right out of a boutique hotel. When installing a bathroom you often find that you need to add a false wall to conceal pipework. Not all of the space behind this wall will be covered with pipes, however, so use some of this void to create a set of alcove shelves. This extra display space is particularly useful above the bath or within the shower area as it means that sponges, flannels and toiletries are always close to hand. 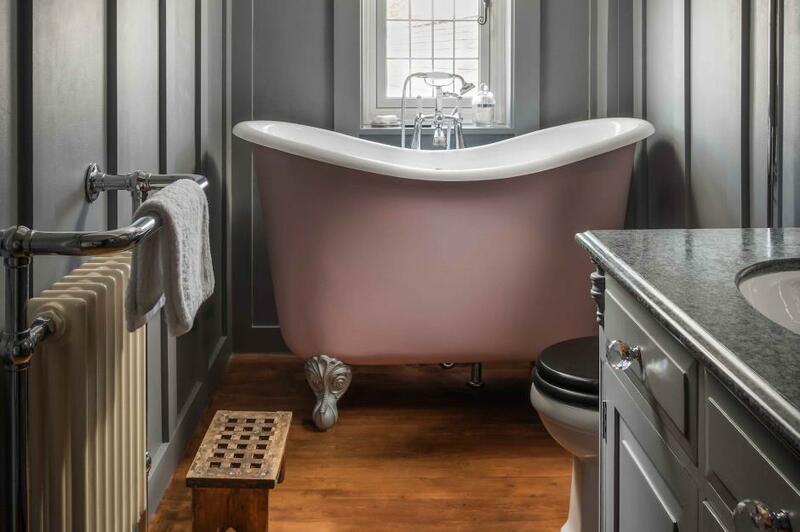 You may not have room for a standard sized bath but that doesn't mean that you have to discount the idea of having a bath in your bathroom. Many models are now available in miniature. 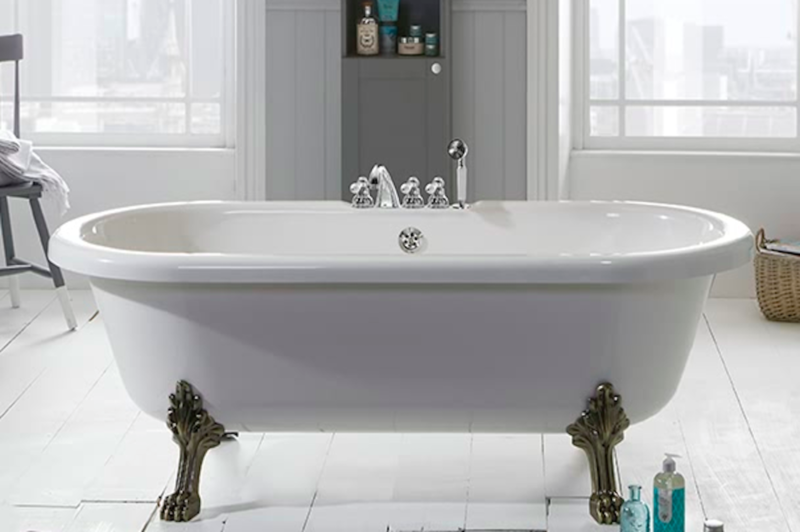 Period style claw-footed tubs even come in reduced size versions, so you needn't miss out on long soak in a hot bubble bath. If you can fit in a shelf or two do. A small display area where you can keep more attractive toiletries, store a pile of freshly laundered towels, candles and perhaps place a plant or two, will help to make your bathroom look more lived in and spa-like. For a clean modern scene choose floating shelves, for a more traditional feel go for a small painted cast iron or glass shelf. Radiators can make a stylish design feature but they can take up valuable wall space, so let them double up as towel rails, too. Some heated towel rails have shelves where spare towels can also be stored. If a heated towel rail isn't powerful enough to heat the whole room, think about adding underfloor heating instead of an additional radiator - in a small bathroom the running and installation costs shouldn't be too steep. If space allows, try to include a basin with countertop space around it upon which you can place beakers of tooth brushes, a soap dispenser and lotions. 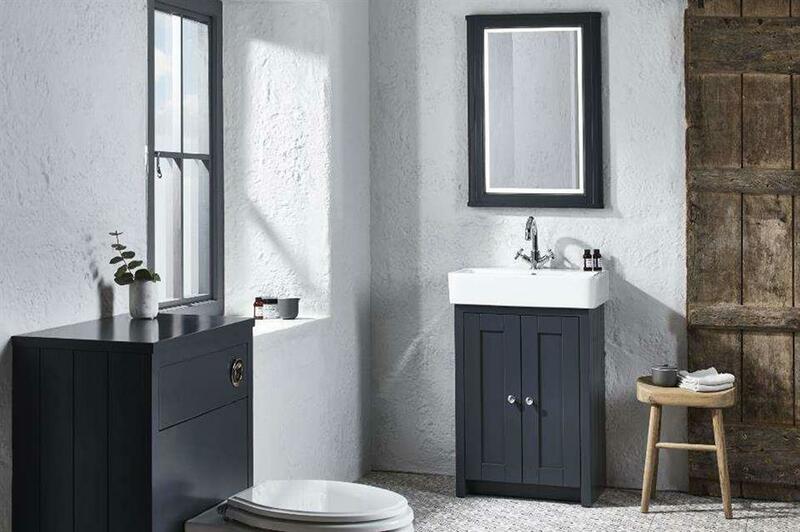 A basin vanity unit that has a roomy counter, hidden storage drawers beneath and an integrated towel holder is a real winner. By boxing the bath in with the same colour and style tiles as the walls and the floor the bath will seem to disappear into the wall. The large tiles also help to enhance the feeling of space and bigger tiles are generally cheaper to buy and install too. Hide the bathroom door away by covering it in the same material as the rest of the wall. Close the door in this feature wall and you will really feel like you are getting away from the stresses and strains of everyday life, a true inner sanctuary tucked away in the centre of your home. Opting to conceal the doorway with a horizontal pattern will also help to visually widen a small room. 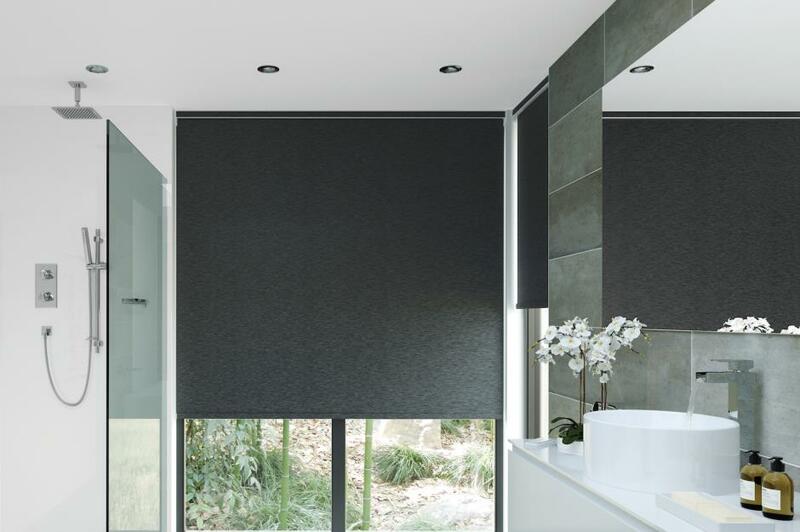 The latest lighting technology can transform your bathroom via an app. Use low-level lighting to create a dreamy romantic scene within which to unwind in at the end of a long day and switch to bright overhead lighting to wake you up first thing in the morning. 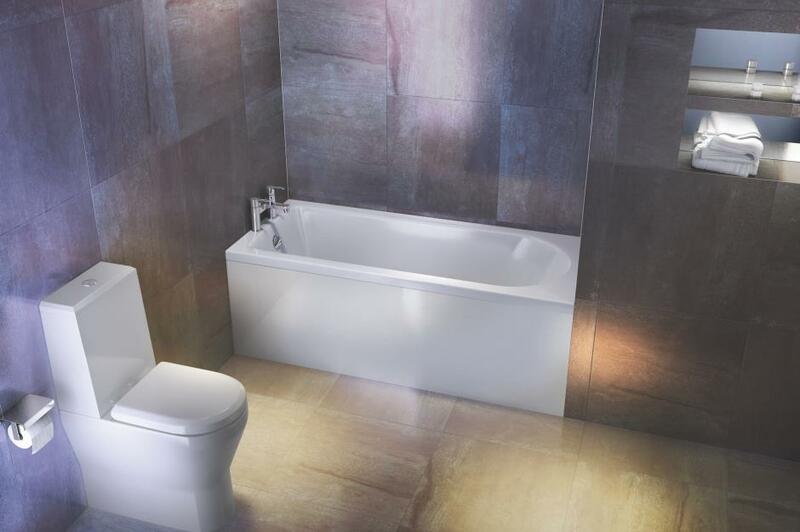 You can also dramatically change the colour of your bathroom just by turning your LED lights from say white to pink. 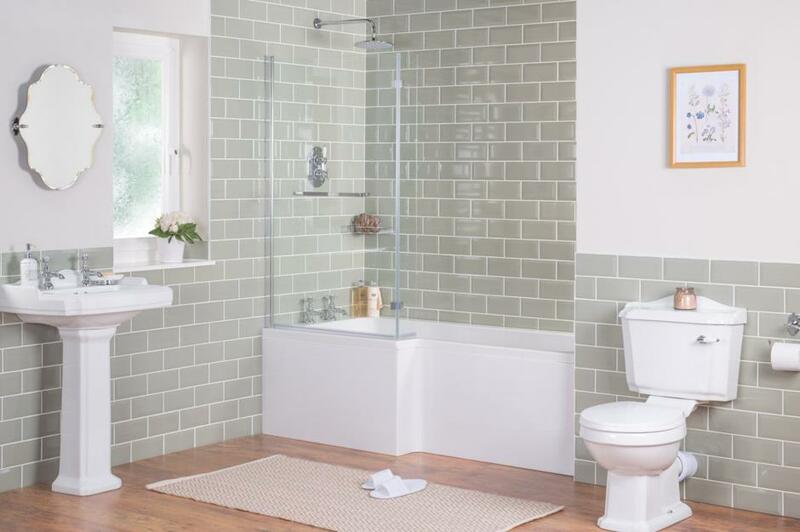 A small bathroom can only cope with the bare minimum of furnishings before it becomes cramp. That said, don't hold back on personality; This patch-work style feature wall lengthens the room and makes a feature of the small bath. The pillar box red lighting is chic and unique.